Turkey's Leader And Supporters Give Trump Benefit Of The Doubt — For Now : Parallels Last year, Turkey's president condemned Trump and suggested his name be removed from two skyscrapers in Istanbul. But now the government and its supporters say they're glad he won. 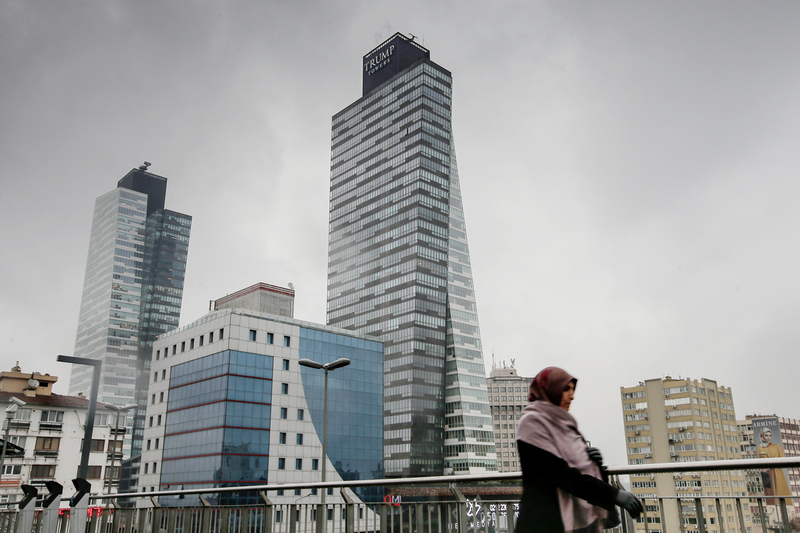 Turkey's Trump Towers rise above the Sisli district in Istanbul, the city's European side. In this case it's Trump in name only – the Turkish owners paid for the right to use the name Trump Towers. Offices are situated above a shopping mall. Donald Trump's election win has focused attention on his business interests around the world and how they might affect his foreign policy. One such place is Turkey, an important NATO ally neighboring the hot spots of Syria, Iraq and Iran. By far the most prominent reminders of the U.S. president-elect in Turkey are Istanbul's own Trump Towers. They rise above the Bosporus Strait on the city's European side, twin glass and steel edifices bearing the familiar Trump brand. In this case, it's Trump in name only – the Turkish owners paid for the right to use the name Trump Towers for buildings containing offices above a shopping mall. The mall is a familiar mix of international brands that might be found in any number of countries. Outside the Burger King stand in the food court, students fresh from their English-language studies at a nearby university attack piles of french fries and consider America and its incoming president. Fatih Balci, 23, says he's learning English because he wants to travel. "Yeah, I would like to go to United States," he says. But he reverts to Turkish to explain why he's looking forward to a Trump administration. "I believe it might be a new beginning for Turkey-American relationships. Probably they're gonna send back Fetullah Gulen," he says, referring to the U.S.-based cleric Turkey accuses of being behind a failed coup attempt in July. Seeing Gulen back in Turkey to face treason charges — which Gulen denies — is at the top of Turkey's wish list for the next U.S. administration. Turks are hopeful that retired Lt. General Mike Flynn will support Turkey's views in his new role as Trump's national security adviser. On Nov. 8, The Hill published an op-ed by Flynn saying the U.S. "should not provide [Gulen] safe haven." Questions have been raised about whether Flynn's consulting firm was hired to lobby Washington on Turkey's behalf. But what about Trump's controversial campaign pledge to halt Muslim immigration? Balci isn't worried – he calls it political rhetoric calculated to appeal to Islamophobia among some Westerners. Late last year, things looked different. Trump's comments on Muslims seemed likely to trigger a Turkish backlash. President Recep Tayyip Erdogan said he'd been wrong to attend the opening of the Trump Towers in 2012, and warned that Trump's comments were a sign that Islamophobia was spreading to America. Erdogan said Trump had "no tolerance for Muslims in America," and called for his name to be removed from the Istanbul towers. For whatever reason, the name was not removed. And now Turkey's leaders are sounding positive about Trump's win. Author and columnist Mustafa Akyol says they suddenly seemed to forget the anti-Muslim rhetoric and began focusing on another aspect of Donald Trump – his stated reluctance to pressure other leaders about things like their human rights record. "So it's a kind of live-and-let-live world – nobody should criticize us, we do what we do in Turkey," says Akyol. "I see the sympathy in Turkey for Donald Trump as naivete. A country like Turkey should have reservations about a presidency by Donald Trump, which might cause big problems for Muslims in the United States." Akyol says Trump could also cause Turkey problems next door, in Syria, if he follows through on his desire to cooperate with Russia and the Syrian regime on fighting Islamic State, as opposed to pressing for President Bashar Assad to step down, as Turkey has demanded. But for now, young Turks will continue to hang out at the Trump Towers mall and talk about their plans for coming to America.